Can you believe it is November 1st?! My October was crazy busy with all sorts of fun, interesting, educational activities, but I am ready for a return to my comfort zone. My blogging routine suffered, as did my reading and writing, but I am now back on track with a plan to stay on track for the long term. I continue to read Harry Potter, although I have fallen behind my original goal of finishing the series by the end of the year. I should complete the third book, Harry Potter and the Prisoner of Azkaban, tonight and then promptly start the next book in the series, Harry Potter and the Goblet of Fire. I plan to write a short review of these first three books sometime soon, however my review will probably be slightly different than most. I am reading Middle Grade books for entertainment, of course, but my primary reason for focusing on this genre is to help me write Middle Grade fiction. I am not reading these books as a young student might enjoy them, but rather as an adult author who wishes to hone her craft. To that end, I not only plan to continue reading this classic series, but I will also read new MG releases, especially those classified as historical fiction. It is also my goal to start reading past-as-well-as-present literary award recipients (Newberry, Cybils, and William Allen White). A writer must read… and I need to do more of both. Hopefully I can develop a reading and reviewing rhythm by the first of the year. It is my sincere desire to post regular book reviews throughout 2016. Ah November. That time of year when the solitude of writing becomes a popular cultural event. I am referring to NaNoWriMo, of course. I have enjoyed this writing frenzy in the past, having written 50,000 words of an adult contemporary novel in November 2010 (which will never see the light of day)… and another 50,000 words of a middle grade historical fiction novel in November, 2013. I am currently struggling to revise that mess of words into a cohesive storyline. 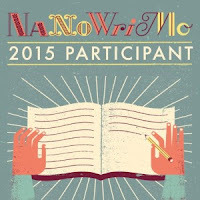 I am not participating in NaNoWriMo this year – or at least in the traditional sense. However, I do plan to focus on writing this month. I have decided to take this hobby to the next level. It is time to be serious or stop talking about it. Serious writers write. Serious writers read. Serious writers submit their writing – and learn to accept rejection. Serious writers do all these activities whether they feel like or not. So my goal for November is to write 500 words a day – five days a week. This can either be a blog post, an article, a scene for First Impressionism… anything. But it has to be a focused piece of writing that can be later revised and polished for the public’s eye. I continue to teach the Storytelling Workshop for high school students, and the class of six continues to inspire me. They are working hard to develop believable protagonists and tight storylines. I soon plan to write a review of the curriculum I am using, The One Year Adventure Novel. It is fabulous! I just finished teaching a new adult course called Journaling towards Wholeness. Three dedicated women came to the class every Wednesday night during the month of October. Each week we focused on a different type of journaling: spiritual, expressive, and reminiscent. I plan to offer the class again next semester, but in the meantime thought I would share the information online, for anyone who might be interested. I started a new blog for this purpose: Revising Life after 50. While many of the posts will focus on journaling and how it can help us discover our purpose post-empty nest and retirement, I will also share thoughts and ideas on other areas of personal interest, such as Traveling, Photography, Scrapbooking, and maintaining a healthy lifestyle. I’d love to have you stop by for a visit sometime, if you are so inclined. Well, I don’t know if you are into baseball, but we are pretty excited here in Kansas City. Our beloved Royals are now ahead in the World Series, 3 games to 1. They could clinch it tonight. Each game has left me a nervous wreck… but I love cheering for our boys in blue. #GoRoyals. I hope that your reading of award-winning fiction really helps you hone your writing skills. I try to tell students who want to write that they have to read, too! Go Royals! You are absolutely right about writers…writers write. That's the most important thing. I'm proud of you for making a commitment to write every day. Good luck! Actually, Kay… I am seriously considering participating in the Estella Society Potter Binge. I will check it now. And….. the Royals WON!!!!!! Good luck with your goals this month. Thanks for the encouragement… just one day at at time is all I can do.